There are countless discount sites now for prom dresses, bridesmaid dresses, and even wedding dresses. I know, it's every girl's dream to have the boutique experience of trying on dresses with friends and family. Finding "the one" is just as important when it comes to the dress as it is to finding the right guy. But you can still have that experience while ordering something much more affordable online. It's even easier to go about it this way now that the biggest trend for bridesmaids is to be coordinated but not necessarily matching; to pick a common color, length, and fabric but to be more flexible on the silhouette. When I was a bridesmaid for my best friend recently, we went to bridal shops so I could try on all of the navy chiffon gowns, for example. After trying on some very beautiful dresses, we both decided I'd go with a strapless sweetheart chiffon pleated gown. As long as I stuck with that guideline, it didn't matter where I bought it from. I ended up finding a gown similar to the $250.00 dress for under $100.00 online. You can even get a beautiful wedding gown for around $100 on these dress sites. I would much rather do than than spend thousands. 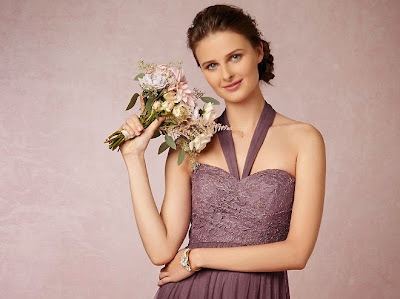 Another thing I noticed about these sites is that a lot of the chiffon bridesmaid gowns, often priced under $100 and even under $50, are available in white - the perfect affordable option for the bride who wants a simple dress. Getting the dress in just the right size is a concern, but it doesn't have to be. These sites ask for your specific measurements. That is often how it goes with the pricey bridal boutiques as well; they ask for your measurements and place an order for the dress. When it arrives, you may or may not have to get alterations.You wind up with the same quality and a beautiful dress for a fraction of what it would cost you to get it from a bridal shop. Spend all of that saved money on a fun honeymoon, or something really important, like a live string quartet! This post is brought to you in part by PromTimes.co.uk. Absolutely gorgeous! Love those dresses!